Maul Technology sets standards of customer service few can match. Our commitment to be customer responsive is combined with a working ability to be flexible in every element of the business, making customer service our key quality standard. Long experienced in the design and manufacture of IS machines and associated glass forming and control equipment, we cover the entire range of production needs for IS machine operation. Our production facilities will manufacture and assemble any size machine and number of sections. M-2000 systems have an excellent track record of reliability with many controllers having run for several years without incurring a failure. This is the kind of "up time" required by 24/7 operations. Maul Technology has satisfied customers around the globe that can attest to the integrity of its wide range of products and services. We are very conscious of the need to build and maintain close working relationships with its customer base. We feel the best way to achieve long lasting partnerships with our customers is to provide superior products and excellent service. This philosophy has been applied to the M-2000 product line. These systems are tools, very large tools, which must enable glass manufacturers to produce higher quality ware more efficiently. We are constantly looking to improve these products by carefully considering customer requests for the incorporation of new features that will enhance their production processes. New software releases are offered on a continuing basis and as new technology is utilized, additional performance improvements can be realized from the installation of hardware upgrades that are made available from time to time. Hardened drive gears are available in all sizes. Perfect tolerances are maintained on the hardened bushing and guide rods. Interchangeable with other mechanisms. Positive latch feature and constant grip nuts are available. New and improved Anti-Backlash Neckring with Needle bearings on the main shaft, seals in the end bearings and split gear. 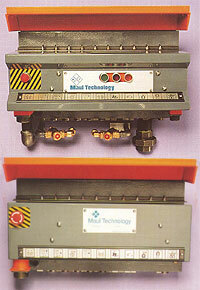 We manufacture a complete range of Constant Cushion Invert mechanisms to suit all IS machine sizes. 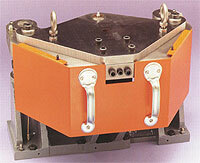 We manufacture a complete range of Constant Cushion Take Out mechanisms to suit all IS machine sizes. This derivative of our Heavy Duty Baffle Mechanism has been developed in answer to customer demands. Direct Operation - speed control from the valve block. Remote cushioning piping internal in the section frame and needle valve control to the rear of the blank bracket. The need for all external tubing to the mechanism is removed. Available in standard or short stroke and is fitted with a solid piston rod for use with external final blow. Each mechanism contains new components together with existing sub assemblies which have proven themselves in extensive field trials. Designed for use on "E" and 5" machines operating single or double gob and 6" and 6 1/2" machine operating single, double or triple gob. The Final Blow Trip Valve, Junction Block and Sleeve Bushing have been eliminated from the Cylinder Head. These mechanisms are equipped with solid piston rods and must be operated in conjunction with External Final Blow. For use on a range of IS Machines. The Heavy Duty Funnel Mechanism is designed for use with centering rings and contains new components together with existing sub assemblies which have proven themselves in extensive field trials. Maul Technology Linkage in Oil yields increased clamping force on both Molds and Blanks as well as prolonged operating life. The revised linkage design provides an improved mechanical advantage resulting in greater closing forces. Our on-site service teams are experienced and arrive well equipped to align, set up and make whatever final adjustments are needed to maximize machine performance. They will provide whatever level of service you require, from relatively minor repairs to full scale installation and commissioning projects along with any subsequent service and maintenance needs thereafter. We will provide a full service team or an individual service engineer as required, well supported by substantial stock holding of spare parts and a high quality manufacturing service of spare parts which are universal in their suitability for use on all major IS machines. We take customer service to the customer with complete facilities for every form of on-site mechanical and electrical work. Teams of highly skilled service engineers are well equipped and quick in response for every customer operating need. 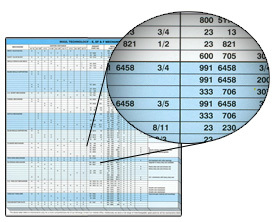 Machines can be quickly assessed and estimated for repair with detailed lists of parts. Modular sections and mechanisms can be refurbished and refitted or replaced with new components. Machine upgrading can substantially update existing installations to bring performance and response in line with the recent advances of control technology, with electronic timing, electronic conveyors and servo-controlled mechanisms. Any form of machine process and configuration change can be engineered, together with on-site mechanism repair.